To join the A4D team, email admin@arts4dementia.org.uk and include “Run RPHM” in the subject line. Of our 20 places, we launch with 7 runners having pre-booked and others expressing interest. It will be a wonderful day, but more important, by your running, you will be helping to transform the lives of people with dementia and their carers, through the provision of challenging arts workshop programmes for people living with early stage dementia. About Arts 4 Dementia. A4D develops innovative, person-centred arts programmes to re-energise and inspire people in the early stages of dementia and carers, to help them live better for longer at home. Our website uniquely signposts arts events nationwide for people living with dementia; and we provide early stage dementia awareness training at London arts venues for arts facilitators from all over the country. The 700-plus workshop leaders we have trained to date will deliver arts opportunities to over 13,000 people living with dementia this year. A4D focuses on what people can achieve – often very much more than they imagine. Video. You can see our work and the impact on participants with dementia, carers and volunteers here. The Course takes in a 13.1 mile route, passing through Hyde Park, Kensington Gardens, St James’s Park and Green Park. Runners and supporters have great views of the capital’s landmarks including Buckingham Palace, the London Eye, the Houses of Parliament and the Royal Albert Hall. 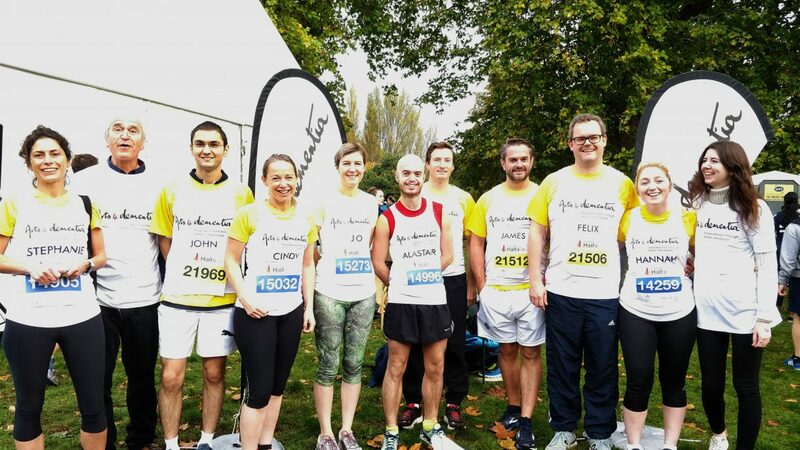 If you’d like to join the A4D team, email admin@arts4dementia.org.uk and include “Run RPHM” in the subject line. Visit Virgin Money Giving to see how our team are doing, and to donate.